Nu-Miracle Press has a large selection of signs for you to choose from. With fully customized designs, you will get the exact appearance you want, with your choice of materials used and presentation. One of our most popular choices for signs are Lobby Signs. These are perfect for offices with a walk in waiting room. A lobby sign sets the immediate tone and attitude for your customer’s experience. A professional sign in the reception area of your business makes a good first impression on everyone who walks in, and should include your companies name and logo. Not sure what to put on your new sign? Our team can help with that also. Our team of graphic designers will listen to your vision and bring it into reality. We can even design a new logo for your business, which you can use on all your marketing and branding materials. Whatever you envision, we can create. Our signs can be any size and shape you want to bring your vision into reality. Show your business’ personality with a custom sign that represents your mission. A sign can inform customers where your office is located, or just welcome newcomers into your office. No matter the use, a sign can make your office a more friendly and welcoming environment. 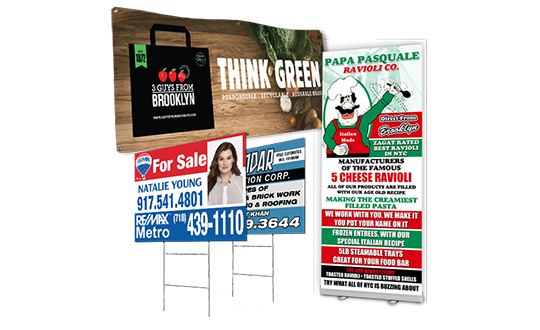 Ready to get started with a new sign for your business? Contact us for a free and fast quote, or call us for more information.